Excavations at Crossrail’s Broadgate ticket hall at Liverpool Street provided archaeological evidence for an area outside Roman London’s northern defences, a landscape dominated by a former tributary of the Walbrook stream. Drainage features were succeeded by an early 2nd- to 3rd-century AD road running west from Ermine Street towards the fort in the north-west corner of the town. To the south of the road, seven 2nd-century AD inhumation burials, including three decapitations, and one cremation burial formed part of a burial ground in this waterlogged area, where evidence of flooding suggested an explanation for the accompanying disarticulated human bone. 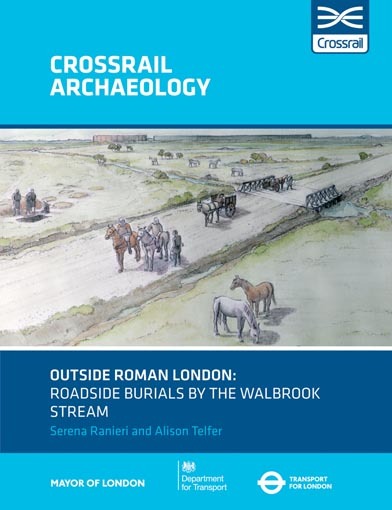 This publication is one of two exploring the archaeological research for Crossrail at Liverpool Street. Explore the site's findings further in The New Churchyard: from Moorfields marsh to Bethlem burial ground, Brokers Row and Liverpool Street.